How much zoom is too much zoom? I recently got to try a 3x teleconverter on my cheap Tamron 70-300 zoom lens. Since my camera has a 1.5x magnification factor, the lens itself has a magnification equivalent to a 450mm lens. Through a 3x teleconverter on it and it is equivalent to a 1350mm zoom lens! This super zoom comes at the price of quality. I saw one comparison of usiing 1.4x teleconverter to resizing. It used several lenses including a consumer grade zoom lens (like mine) with a teleconverter, versus using it without one, but in photoshop enlarging the photo to 1.4x original size. In general, the photoshop enlargement looked better. I decided to try a similar experiment with a 3x teleconverter. There are a few things to note when using a teleconverter like this. First, it will cut down on the light significantly. I pushed the ISO up to 800 and still had a fairly slow shutter speed. It also made the viewfinder a bit dim. Second, you have to use a tripod. In fact, that is not enough, I had to use a tripod and a cable release, and a 2 second timer, and mirror lockup (on my camera it isn't actually mirror lockup, it is called anti-shock), on a calm day. Just touching the shutter release was enough to make the whole image shake for several seconds. Finally, it probably won't auto-focus and the manual focus will be tough to get right since a very small turn will go from out of focus, through focus, and back to out of focus. Plus, the whole thing is shaking, so it is hard to tell if it is focus. I took several versions of each picture you see here and just posted the best one, it is very much trial and error. Here are several pictures I took with various zoom settings and lenses. Except for the final two, I didn't do any sharpening on them. Most of them are sized down so you can get an idea of the angle of view and the inset pictures in the red boxes are a full size section of the original photo. I took these images with jpeg compression, and resized them smaller. This is an overview shot with the widest angle lens I have. It is 22mm equivalent. 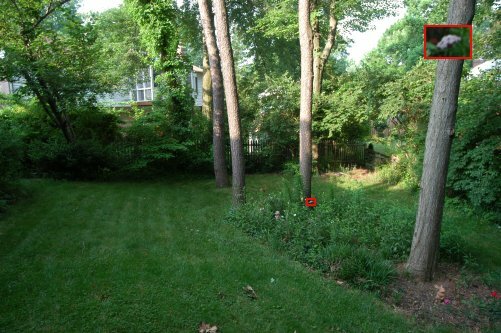 The small red box in the middle of the picture is the area I have concentrated on in subsequent shots. The inset on the upper right is a full size crop of the box. 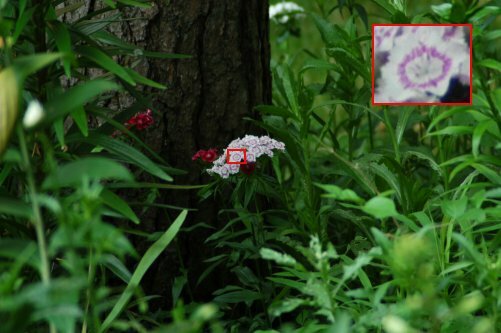 The white blob is a cluster of flowers, you will see more of them. 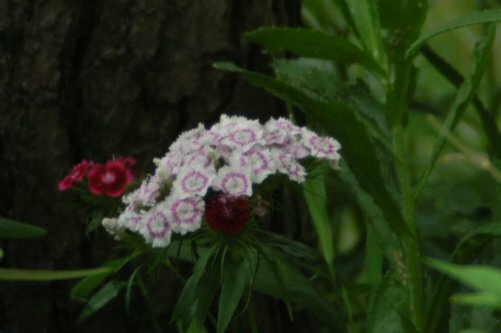 This is my 70-300 zoom at maximum (450mm equiv) You can see the cluster of flowers in the center of the picture. 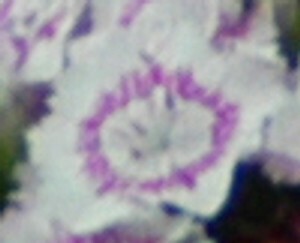 The inset is a single one of those flowers at full resolution. This is the super zoom. 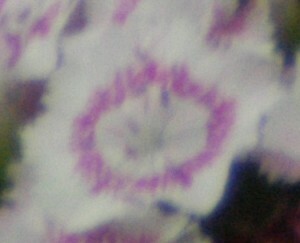 It is equivalent to a 1350mm lens, or about 27x magnification. You can see a dramatic increase in the size of the flower. I couldn't inset a full size crop because a single flower at full resolution was almost as large as this image. In real life, you would be able to sharpen the picture and see if that helps. These are the same two pictures with the same amount of unsharp mask applied to each. It helps them both, but end the result is the same. The one on the left (the interpolated one) has noticeably lower resolution. Look closely at the ring of color on the flower, see how there are many small splotches of white on the one on the right that are almost entirely absent from the one on the left? So how much quality do you loose? Usually, you would use a teleconverter when you absolutely can't get closer, but in this case, I could "zoom with my feet" and do an actual comparison. It is obvious how poorly the teleconverter fares in this test. by getting close I get a picture that is both sharper and zoomed in tighter. 3x teleconverters are hard to work with. They will significantly lower the quality of the picture. However, they will usually give you a picture that is better than just enlarging a photo 3 times the original size. If you have the option of moving closer, that will give you a much better picture, save the teleconverter for when you have no other choice. I repeated this experiment several times across two different days and although I don't have examples posted, I noticed several interesting tidbits. First, when I manually focused at 450mm, my results weren't as good as using auto-focus, second, in one of the tests (see below), I used a different set of flowers about 5 feet closer. In that test, the victor wasn't as clear. It was at a close enough distance where the 450mm lens could make out some of the white dots in the color, so scaling it up worked better. 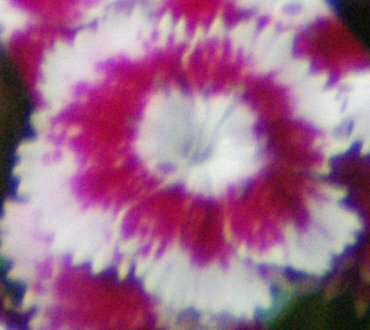 Also, the flower had a darker color ring and the teleconverter had some trouble with color accuracy at the border of the red and white. 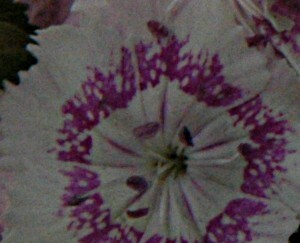 In this test, I took pictures of flowers that were a little closer. Once again, the one on the left was taken at 450mm (equiv) scaled up 3x and the one on the right used the 3x teleconverter. Both then had unsharp mask applied I think it it is a toss-up which one is better. I can see a smidge more resolution on the one on the right (the white dots are a bit more distinct) but it suffers from significant color problems. Copyright 2005, G. Edward Johnson. All rights reserved.